Sharon Fournier has been the Principal of Holy Family School for the past six years and was the Assistant Principal for three years prior. She attended the University of Akron where she earned Bachelor and Master of Science degrees in Education. She received her Principal/Administration License in 2005. Mrs. Fournier taught for 18 years at St. Sebastian School in Akron before becoming an administrator at Holy Family School. 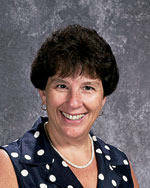 As the principal of Holy Family School, Mrs. Fournier is committed to Excellence in Education. She enthusiastically challenges students, teachers and staff to demonstrate their love for Jesus on a daily basis. Mrs. Fournier enjoys spending time with her family. Married for more than 30 years, she and her husband raised two wonderful boys. Both are married and have children. Mrs. Fournier spends much of her free time watching and interacting with her grandchildren.